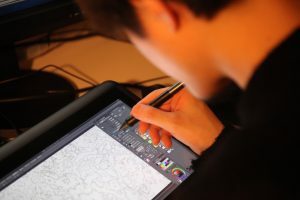 Through this service, you can have your work edited by professional animator Kiyotaka Oshiyama, receive expert advice on how to convey your ideas and gain know-how used in the animation industry. こんな方にオススメ Who is this service for? The advice I offer will vary depending on the theme of your work. I try to approach each piece as neutrally as possible, but since I have preferences of my own, my advice should be considered as subjective. Please take my advice as just one of many possibilities and enjoy! Otherwise you may lose the fun of drawing. I will not tell you what the theme of your drawings should be. It is for you to choose your theme and decide what you want to transmit and express before you start drawing. That way, you will know when you fall short of your ideals and you will be able to learn more. Atelier Durian is a private internet community operated via Twitter, led by Kiyotaka Oshiyama. By joining this community you can view edited materials and gain animation know-how directly from Studio Durian’s Editing Service. You will gain insight into how the animation production process works and get an insider’s perspective of the animation industry. You can also find out about Kiyotaka Oshiyama’s current projects. The community is a platform where creators and members can meet and share knowledge. Animator/Animation Supervisor/Director of Durian Inc.
Kiyotaka Oshiyama has been drawing since he was child. Armed only with self-taught knowledge, he started his career as an animator in the production company XEBEC Inc. He later went freelance, and polished his skills through numerous productions such as “Coil - A Circle of Children”, “EVANGELION:2.0 YOU CAN (NOT) ADVANCE”, “Fullmetal Alchemist: The Sacred Star of Milos” and “SPACE DANDY”. Through his work for STUDIO GHIBLI he learnt the animation methods of Hayao Miyazaki through productions such as “The Wind Rises”, “The Borrower Arrietty” and The Ghibli Museum’s short film “Mr. Dough and the Egg Princess”. His directorial debut was with TV series “Flip Flappers”. More recently he has worked on “DEVILMAN crybaby”, “FLCL Alternative” and “FLCL Progressive”. He is currently working on his own original creation whilst participating in several other productions.